It seems that We face a cruel irony of history, that history will repeat itself. The landscape of America would be changed forever. The implications are so severe that most people choose to not even consider them. How many other people are aware of this information? Why isn’t it talked about more in mainstream media? And has anyone left us any “WARNINGS” in the past? The Hopi Indians of Arizona said the Earth has been ‘destroyed’ multiple times, and there are warning signs that signal a cue for the next reset. To begin, lets look at a site in Midwest Georgia called The Georgia Guidestones. These enormous pieces of granite were created and erected by an unknown man, calling himself R.C. Christian. They were dedicated to Elbert County,GA in 1980. What makes the Georgia Guidestones so mysterious is that we don’t know exactly WHO made them, WHY they were made, and why to this day…Elbert County,GA owns and protects the stones and has them under 24 hour video surveillance. If they are just a relic on some old farmland, why does the landowner allow them to stay up? Who is in on the preservation committee? The guidestones are made of quarried granite, and the words are etched into the stone. You don’t create something like this unless you are planning for it to withstand time, war, natural disasters, and anything else that time can throw at it. What did R.C. Christian mean when he said “Keep the world population at 500 Million?” We all know overpopulation of any species in a specific area leads to an eventual food shortage or a change in the environment that kills or depopulates the initial species. Was he looking forward to this time and hoping the survivors would find his monument, and live by it? We find ancient relics in Indonesia, Egypt, and Africa that look as if they were created by some advanced civilization that possessed far superior technology. Will some future human civilization stumble upon this structure, or unearth it, and find the “keys to a happy, cohesive world?” Or is this just an esoteric project funded by a group of extreme futurists? There are plenty of videos on YouTube and sites like mine that spell out the specifics of the Georgia Guidestones. I’ll leave links to these at the bottom of the page, but the point of my site is to wake you up to all these mysterious(important??) warnings, and let you research them more as you please. Hopi Indian prophecy and connection to other ancient warnings. 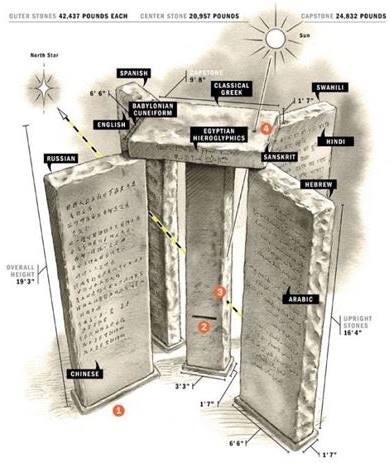 Strange addition to the Georgia Guidestones in 2014?